Join The Mountaineers on a work party to celebrate National Trails Day! Come work on the Eight Mile Trail reconstruction project in Darrington. 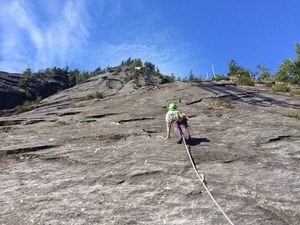 This trail provides access to popular slab climbing at Three O'Clock Rock as well as access to beautiful Squire Creek Pass, which features stunning views of Three Fingers and Exfoliation Dome. This outing is sponsored by the Everett branch of The Mountaineers and Washington Climbers Coalition. Local climbing legends Matt Perkins and Mark Hanna will be participating in case you want to score beta on routes and hear first ascent stories. Sign up today! We will clear large downed trees, cut back encroaching vegetation, and provide tread repair to restore the trail from winter drainage problems. Church Creek trail has been adopted by the Olympia branch of The Mountaineers and this is our first big work party of the season. This lesser used trail passes by old growth forest, lakes, and waterfalls. This work party is in partnership with Olympic National Forest. Sign up today! Ensure the beloved Ira Spring Trail is ready for the summer season. 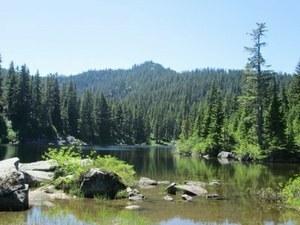 This trail is a major access point into the Alpine Lakes Wilderness, including Mason Lake, Bandera Mountain, and Mount Defiance. We will be working on the first mile of the trail. This work party is sponsored by the Foothills branch of The Mountaineers along with the Forest Service and Volunteers for Outdoor Washington. Sign up today! Join the Foothills Branch Conservation and Stewardship committee for a day of stewardship near Stampede Pass. The crew will be brushing along the Pacific Crest Trail and making sure trail drainage is up to snuff. Please note these outings will fulfill the stewardship credit required in many Mountaineers courses.